I’d have to say that Richard Harding’s first entry in the “Outrider” series was nearly brilliant. Aside from a few pieces of dialogue the book had a tremendous pace and engaging action sequences. Harding followed that book with a sequel in August of 1984, a mere two-months from the release of its predecessor. 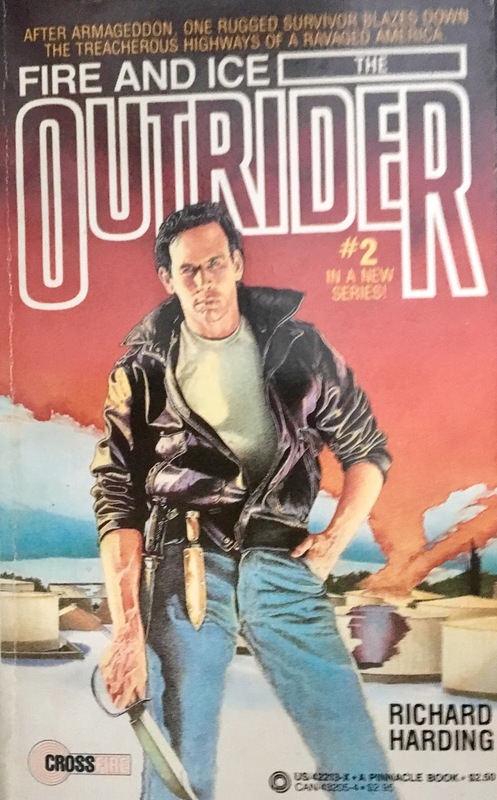 Where Harding had a story to tell with “Outrider”, it’s follow-up is absolutely abysmal. It’s sad considering how promising the series looked. Our hero, the knife-wielding, super-car driving Bonner is laying low in Chicago and chilling with his hottie (Harding never elaborates much on this character but she sporadically appears in both books). His colleague from the first book, Starling, shows up to advise Bonner that it would be in their best interest to find some gasoline reserves. Bonner says he isn’t interested but Starling reminds him that if they don’t find the promised gas reserves (a character in the prior book, Cooker, said it’s the Heaven of gas reserves) then Bonner’s arch enemy Leather will get it. This strokes Bonner’s engines and soon he is out the door and the book’s premise is underway. Bonner, Starling and The Mean Brothers team up with a locomotive engineer to find the gas and bring it back to “neutral” Chicago. Leather and his goons are on the hunt for the gas as well. It sounds good on paper, but Harding misfires terribly. The book just goes nowhere and the action sequences are few and far between. When the bullets do start flying…I just didn’t really care. In fact, I disliked this book so much that it took me nearly two weeks to read it – it’s only 214 pages in length. The huge fight that is brewing between Bonner and Leather (an anticipated continuation of their struggle in the first book) never comes to fruition. The only bright spot for me is the atmosphere. It’s cold, snowy and dark – key elements that keep this book from reaching the “burn the pages now” tier. I have the whole series and will eventually get around to book three, but I might master the art of pruning banzai trees, take cooking lessons and grow my own wine vineyard before I get around to it.